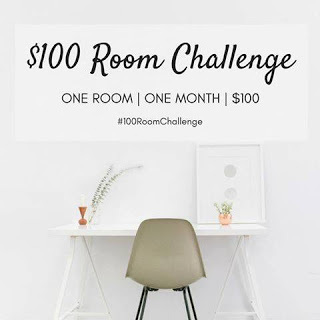 Welcome to the second week of the $100 Room Challenge. You can see all of the carport befores in the Week 1 post. This week I had planned on making the big wooden planter to go in the grassy island, but I got as far as buying the materials before hurricane Irma hit our town. Thankfully we only caught the tail end of it when it was a tropical storm, and we didn't have any major damage. But that did eat up my whole weekend and the power being out got the first two days of the week. So this week, I'll share the one small update we did get to: replacing the old mason jar exterior light with a cheap, modern can light. Back when we moved in, everything that wasn't brick on the outside was painted this muted blue gray. It was old and chippy and just all around bad. Our main door is the one off our carport, we almost exclusively use it to get in an out. But when we moved in, it was the nasty gray as you can see below. Thankfully we had leftover paint from the painting the lower kitchen cabinets, Sherwin Williams Tricorn Black, and painted it as fast as we could. We also added a $10 brushed nickle toe kick to hold together the bottom. We still need to repaint the door and paint the door frame. The whole thing has took a beating as we move furniture in and out over the past few months and it definitely shows. I am also planning on replacing the door bell with this cutie from Rejuvenation, but that won't be part of this challenge. That alone completely changed the entry way look and feel, but there was still the outdated mason jar looking exterior light. It had nothing going for it, it was ugly, used a weird size bulb, and was directly eye level when you went through the door. We went to Lowe's and found this matte black can light on sale. Normally it is $20 (which $20 for a beautiful fixture is amazing itself) but was on sale for $15, and used our Lowes card and the last bit of a gift card to grab it for $11. Not too shabby for a $100 budget! I loved reading about everyone's spaces and the plans for them, I know this will be the be the best round yet! And if you haven't heard, Erin was on Rachel Ray this week! You can see parts of her segment here and here. Stay tuned for next week's post as I hopefully complete the wooden planter and start wrapping the columns. And make sure to check out the other participant through the links below! Wow! Love the change a little paint can make! It's going to look so amazing! LOVE this update - it's funny how your eye seems to always catch the one out of date thing. the new light really modernizes the space! Small thing but a big change! Glad you didn't get hit by Irma. So glad y'all made it through the hurricane safely!! I love the new light fixture!! Love that light! Great find!! I am SO glad you are doing okay after the hurricane. The fact that you even have a post up this week is crazy to me :) I LOVE the new light. It looks perfect with the door. Hopefully, no more drama for you this challenge. I am so happy you didn't catch the wrath of Irma! And that light is fabulous - it goes perfectly with the door! So excited to see your upcoming planter! That modern can light is a great touch! So glad to hear you're OK after Irma! Great update! Lighting is one of those details that makes a big difference! Love the new light and it make such a big difference already! Can't wait to see the end results!! I love the new light! Such a great deal! Love the new light! It totally changed the look of your entry!